Starting fresh with the new year we tried to go cold turkey for all of two days. By the end of the second day only eating raw fruits and veggies, we RAN to the nearest pizza place and binged till we were full. Next we took it slower, cutting out one food at a time. 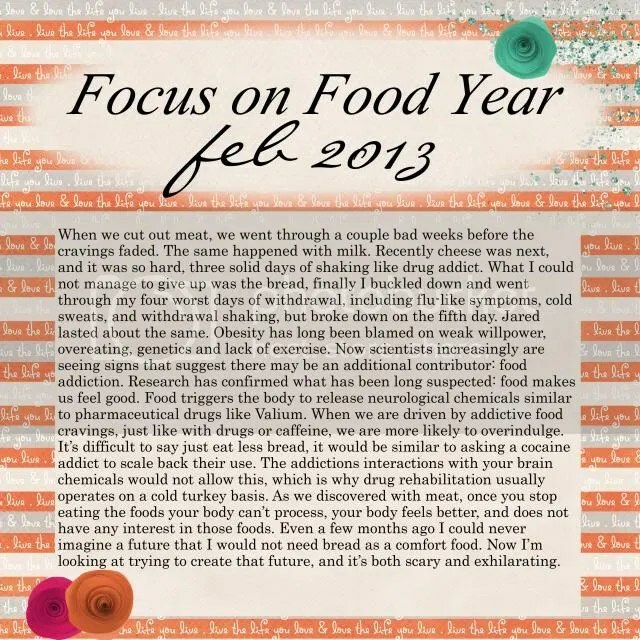 When we cut out meat, we went through a couple bad weeks before the cravings faded. The same happened with milk. Cheese was next, and it was so hard, three solid days of shaking like a drug addict. 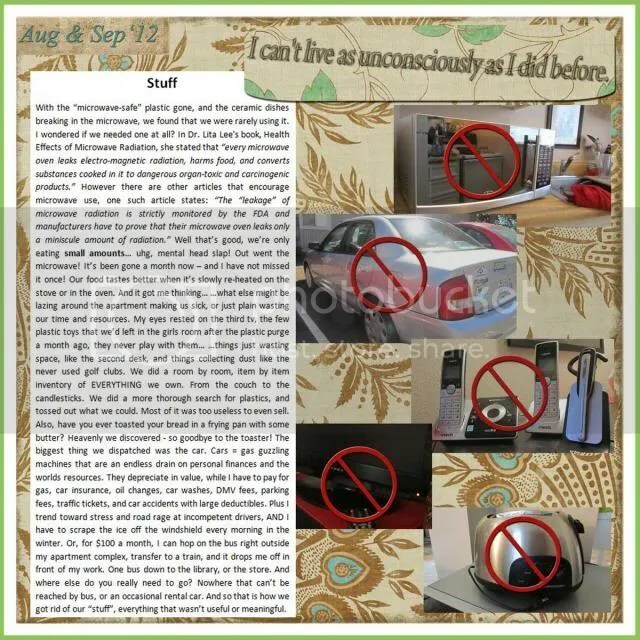 What I could not manage to give up was the bread, finally I buckled down and went through my four worst days of withdrawal, including flu-like symptoms, cold sweats, and withdrawal shaking, I even had to call in sick to work one of the days. On the fifth day we allowed ourselves some sandwich bread, but since then have eaten MUCH less wheat. As we discovered with meat, once you stop eating the foods your body can’t process, your body feels better, and does not have any interest in those foods. You just have to break the craving cycle. Even a few months ago I could never imagine a future that I would not need bread as a comfort food. Now I’m looking at trying to create that future, and it’s both scary and exhilarating. We tried a completely wheat free experiment that lasted three weeks. The first couple of weeks I was not interested in losing weight, so I used small amounts of chocolate, and fries, to get through the cravings. The third week we all felt really really good, but could not maintain the no wheat at all. I may try again, or I may just stop trying to force the issue, and let wheat fade away over the course of a year like I did for meat. Only time will tell. What we learned: changing the way you eat is not about deprivation, it’s about change. Saying “I’m not going to eat cheese today” gets you nowhere. All you can think about is cheese. Instead, if all day you are thinking about the wonderful juicy peach you bought for an afternoon snack, and how tasty that will be, you have positive thoughts. It’s hard to stay hyper focused on something long term. It’s stressful and tiring to stay focused on one life topic, day after day, meal by meal. Sometimes I think we did it the hard way, and other times I know this was how we needed to do it, for our family, to slowly change habits, try out different diets and ways of eating a plant based menu. I feel that with this choice to be simply a whole food plant based vegan, that we are finally on the right track for now, on the path of something healthy that we can maintain long term. I remember feeling so wonderfully healthy when we started eating vegan about a year and half ago, so what has gone wrong? How did we get so unhealthy, and how did we not notice? I imagine what made the biggest difference at the beginning, was merely removing all the processed foods from our diet, and starting to eat vegetables that caused us to feel so well, but slowly we became deficit in the foods we were restricting ourselves from, and the last couple of months we’ve just been feeling awful. So, after reviewing everything I had learned, we decided to stop being vegan. I started looking at how people eat, and why, and success they have with their chosen diet, and as I researched I put all the ‘diets’ into a simple chart. What I discovered was that the people eating ALL these different diets… were ALL healthy! But how could that be? Some don’t eat meat, some eat meat but no dairy, some eat grains, others don’t, and it became very confusing. Finally I started looking at the linking factors, which seem to be vegetables. A LOT of vegetables. Everything else had its place in the food habits of these people, but veggies at every meal seem to be at the core of success for them all. As we’ve been muddling through new recipes, new flavors, new styles of cooking, we have not been totally successful, falling back on our old patterns of eating when all this newness becomes overwhelming. As a family we agree that when we eat plant based we all feel strong, more energetic, and generally happier. 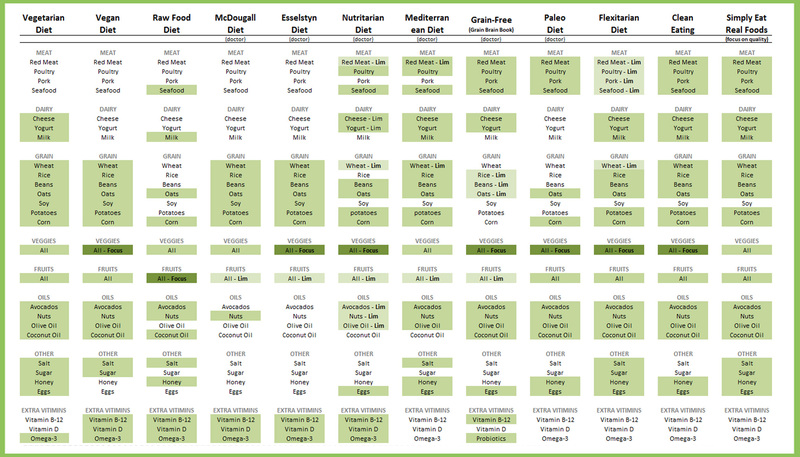 A look at all the plant based diets (most of which we’ve tried), with a comparison chart…. When I eat this way, I feel fantastic, have tons of energy, and lose weight. Does this work perfectly all the time? No. Life happens. When I stray off of this plan all my old issues come back to make me feel ill, and you’ll find me moaning on the couch. After experiencing health I don’t want to feel sick though, so for the most part I WANT to eat this way. The main thing I have learned is to not stress over eating “perfectly”. I still want to enjoy life, a hot chocolate in winter, or cold jello cake in summer is part of life, and I won’t give that up completely, I’ve learned to balance it with eating healthy on the other days of the week to stay physically and mentally well. I hope reading about my long tour through diet after diet helps you skip strait to what will work for you. I wish you happiness and health for life! 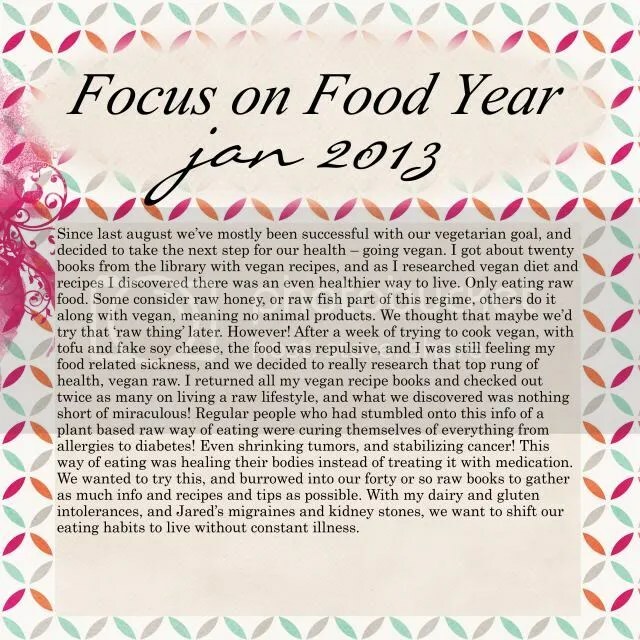 I’ve been reading and researching for three solid years, health books, recipe books, blogs, and more. This is my combined learning, condensed into the recipe cards that I use every day in my own kitchen. These are based on my diet plan, and my tastes. 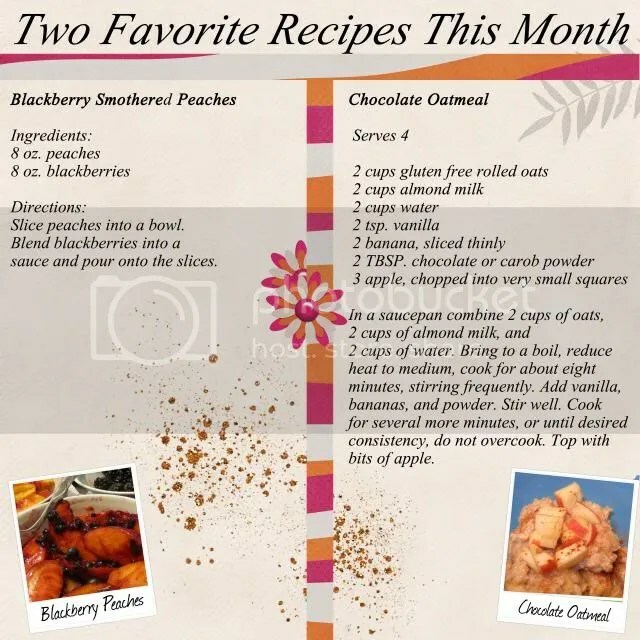 Keep in mind they still include some of the unhealthy recipes that I grew up with, because occasionally I still make these recipes for my planned weekly mental-health-cheat-meals. It all kind of started with eggs. They were one of the last things that I finally took out of our diet so we could be completely vegan… but I’d always intuitively felt that they were healthy, and I missed how good they made me feel. When I had an omelet that my brother made me in Arizona, I really began deliberating over the whole vegan thing. Only lately staying strictly on a high carb vegan diet, my weight refused to budge even an ounce. Even working out really hard, such as in a group class, in a cycling class, on the treadmill, nothing was working. Next I made a strange discovery that whenever I ‘cheated’, and ate an egg, would I lose a bit of weight. And that began to really make me think critically about the way I was eating. I looked into the reasons why other people had ‘fallen off the vegan wagon’, and discovered that it was because they were lacking vitamins to make their body run correctly. 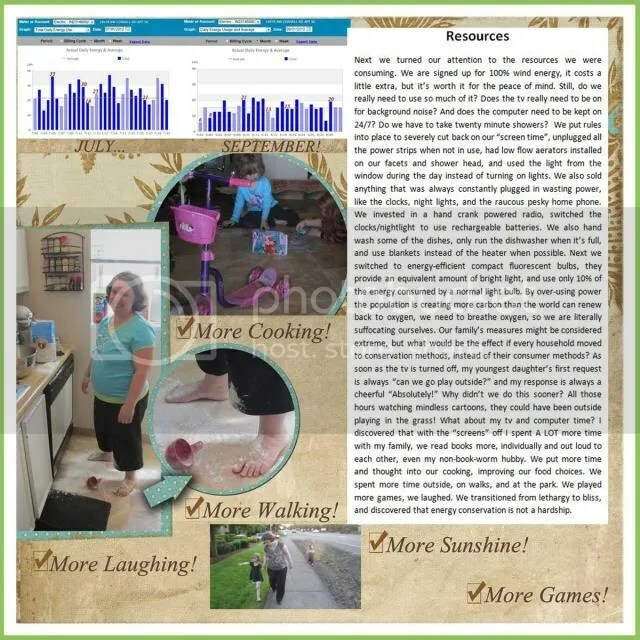 They were experiencing fatigue, digestions issues, hair loss, cavities, loss of appetite, weight gain, unrestful sleep, lowered immune system, depression… I was surprised to realize that my husband and I, combined, had all or most of these problems… and that we didn’t have them before. And in kids, symptoms of vitamin deficiency included unrestful sleep, less vibrant skin, loss of appetite, fatigue, and distended bellies… the girls were showing all of these ills, things I had noticed in them, but had not even considered was due to our ‘perfect vegan diet’. I remember feeling so wonderfully healthy when we started eating vegan about a year and half ago, so what had gone wrong? How did we get so unhealthy, and how did we not notice? 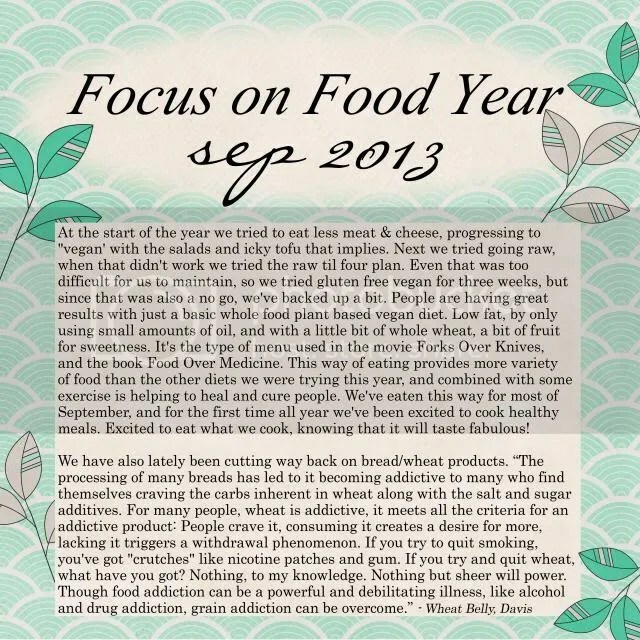 I imagine what made the biggest difference at the beginning, was merely removing all the processed foods from our diet, and starting to eat vegetables that caused us to feel so well, but slowly we became deficit in the foods we were restricting ourselves from, and the last couple of months we’ve just been feeling awful. So, after reviewing everything I had learned, we decided to stop being vegan. But then… what do we eat? I started looking at how people eat, and why, and success they have with their chosen diet, and as I researched I put all the ‘diets’ into a simple chart. What I discovered was that the people eating ALL these different diets… were ALL healthy! But how could that be? Some don’t eat meat, some eat meat but no dairy, some eat grains, others don’t, and it became very confusing. Finally I started looking at the linking factors, which seem to be vegetables. A LOT of vegetables. Everything else had its place in the food habits of these people, but veggies at every meal seem to be at the core of success for them all. Also, quality of food was a link between the diets. Pasture raised eggs, organic grown produce, raw nuts, whole grain bread. No junk food, or processed food. 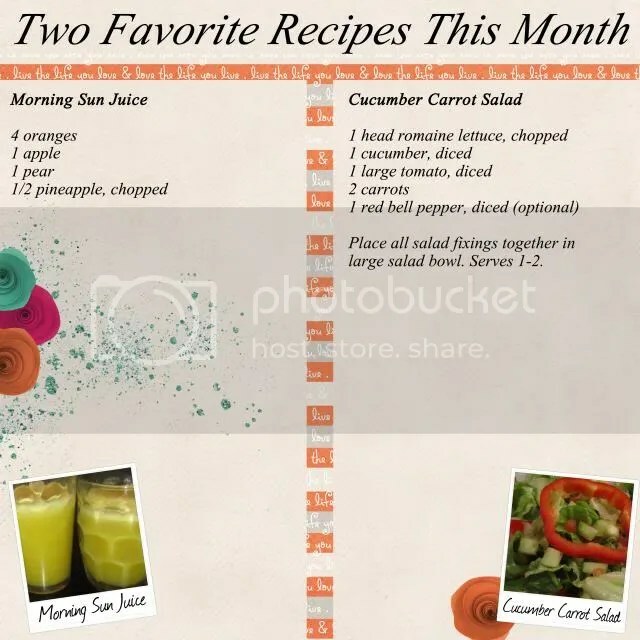 Whole, natural food, that was the reigning theme throughout all the library books, eBooks, medical sites, diet sites, and blogs that cataloged how this or that diet was the best because BLANK. The link I am sure is the vegetables, and quality of food. Here is my chart, the green is things that you are allowed to eat on the diet. The light green with “Lim” is for things that are allowed to be eaten in limited quantities. The dark green with “Focus” is the main food group of the diet. There are complexities to each diet, but undressed, down to the basics, these are their do’s and don’ts. I had eggs for breakfast this morning, and am full and satisfied. I’m glad that we did the vegan thing for a while, because it stopped our cravings for most processed foods, and we had to learn to cook and enjoy vegetables. So with our new healthier eating habits, we’ve started incorporating meat and dairy back into our diet. And instead of focusing on any specific diet, as a family we agreed to simply eat the best quality food we can. Two or more players. One player thinks of a word and writes a line for each letter, then draws a gallows. Not a bad idea to give some adult help on this step. The other players try to guess the letters in the word. 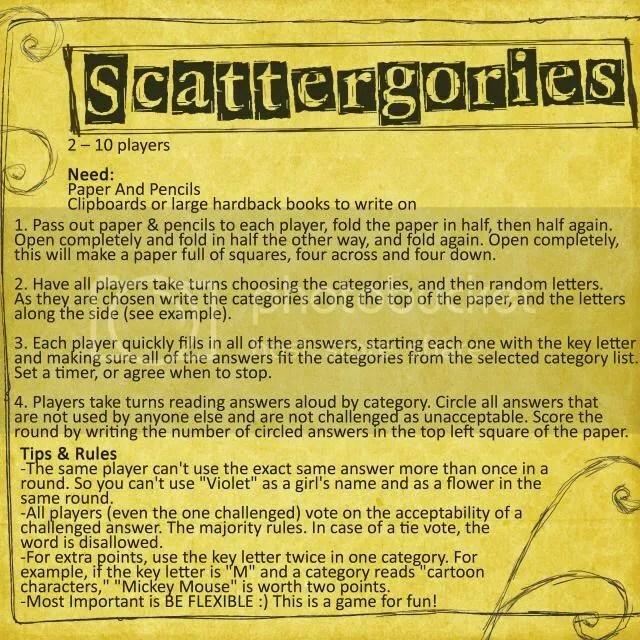 Each incorrect letter means the first player draws a body part on the gallows. The object is to guess the word before you get “hung” – which is a full body picture on the gallows. Draw rows of dots. Take turns drawing a line between two dots. The object is to make a box with your lines and the most boxes wins. Players write their initials in the boxes they draw. Print out the code and have your kids make secret messages in Morse Code. Get a piece of paper. The first person writes down a beginning to a story – it can be one sentence – then folds the paper to cover what he wrote. The second person continues the story without looking and adds a detail or action. That person folds the paper over her part. And so forth, until someone ends the story. Open, read, and laugh! Fold a plain piece of paper into four horizontal sections. The first person draws the monster head, folds over the paper so it is covered. The second person draws the neck, shoulders, and arms then folds over. The third person draws the body then folds it over. The fourth person finishes with the legs and feet. Open and check out your masterpiece! Let your half-starved brood describe how hungry they are in this game, best played about half an hour before you make a pit stop for food. This version of the “I’m Packing for a Picnic” game begins when you announce “I’m so hungry I could eat an aviator” (“alligator,” or “apple”). The next player adds on with a B word. She might say, “I’m so hungry I could eat an aviator and a bunny rabbit” (“belly button,” or “bologna slice”). See if you can keep it up until your family is eating zoos, zippers, or zigzags. Someone says, “I spy with my little eye something green.” Whoever guesses the item correctly goes next. You could limit the items to what’s in the area. Or you could get tricky and play I Spied, selecting items that you’ve already passed. It’s great these days, because we get excited about food seasonally, it’s something to look forward to! When summer came, the first peaches were amazing, now that it’s fall, we’re enjoying autumn squash, including butternut squash, pumpkins, zucchini, and acorn squash, food ingredients that we never cooked with before. 1. In a blender, add chunks of banana and almond milk. Puree for 30 seconds or until thoroughly blended and smooth. Next add oats, baking powder, and salt into the blender; blend again until batter is well-combined about 1 minute. Set aside to thicken up. After a few minutes check the consistency of the pancake batter it should be somewhat thick. If they appear to too thick, add a tablespoon or two of almond milk and blend again. 2. Lightly coat a large nonstick skillet or griddle with vegan cooking spray or vegan butter and heat over medium heat. Drop batter by 1/4 cup onto skillet and gently spread out a bit with a spoon. Place 5-6 chocolate chips on top of each pancake and cook until bubbles appear on top, about 2 minutes. Gently flip cakes and cook until golden brown on underside, 2 minutes. Wipe skillet clean and repeat with more oil or cooking spray. 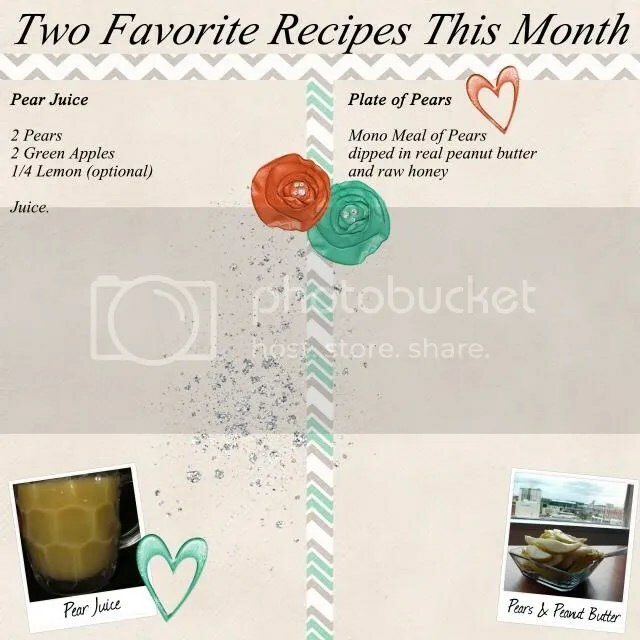 Top with peanut butter, maple syrup, fruit or whole fruit jam. Put all ingredients (except avocado) in a soup pot, bring to a boil, then reduce the heat and simmer for 10 to 15 minutes. At the start of the year we tried to eat less meat & cheese, progressing to “vegan’ with the salads and icky tofu that implies. Next we tried going raw, when that didn’t work we tried the raw til four plan. Even that was too difficult for us to maintain, so we tried gluten free vegan for three weeks, but since that was also a no go, we’ve backed up a bit. 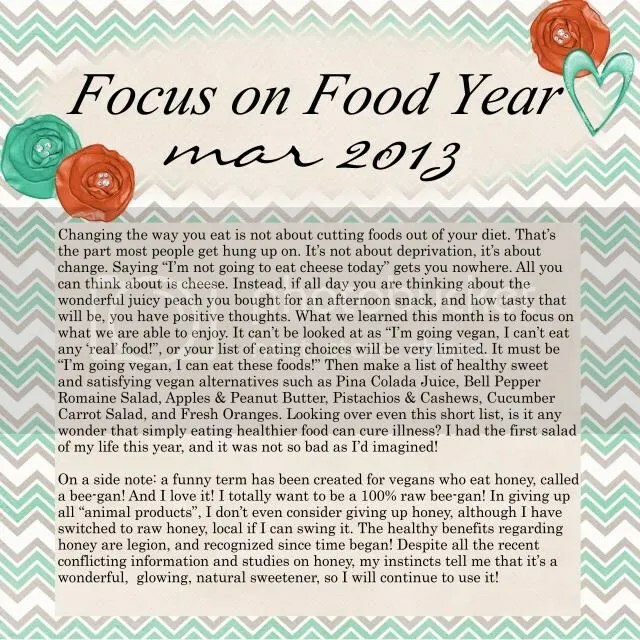 People are having great results with just a basic whole food plant based vegan diet. Low fat, by only using small amounts of oil, and with a little bit of whole wheat, a bit of fruit for sweetness. It’s the type of menu used in the movie Forks Over Knives, and the book Food Over Medicine. This way of eating provides more variety of food than the other diets we were trying this year, and combined with some exercise is helping to heal and cure people. 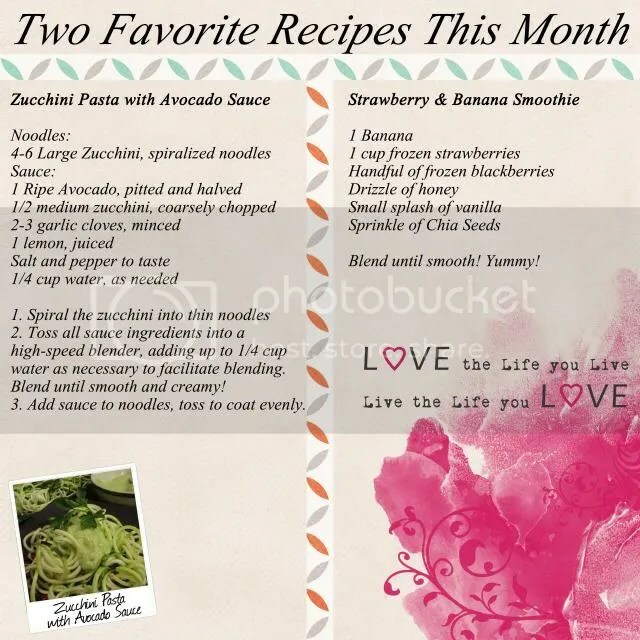 We’ve eaten this way for most of September, and for the first time all year we’ve been excited to cook healthy meals. Excited to eat what we cook, knowing that it will taste fabulous! Layer the above ingredients into some bowls, and enjoy! Combine the diced tomatoes, black beans and corn in a colander in the sink and rinse well. Shake well to “dry.” Set out all food on the table, then layer the ingredients anyway you like over a plate of tortilla chips! 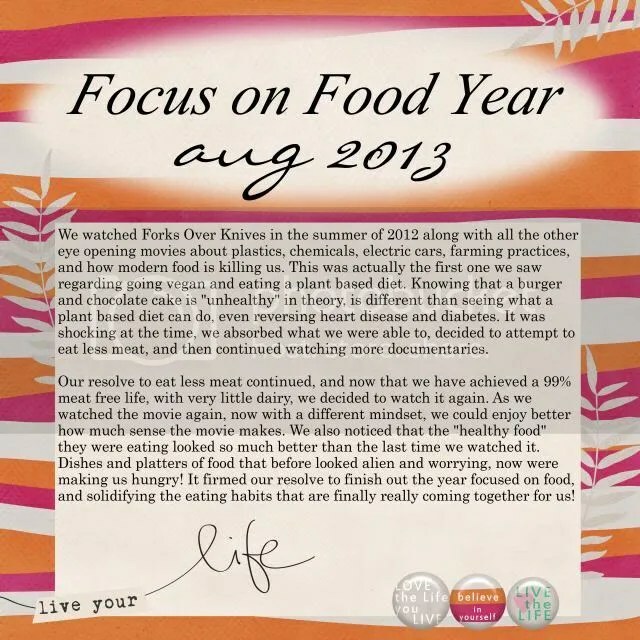 We watched Forks Over Knives in the summer of 2012 along with all the other eye opening movies about plastics, chemicals, electric cars, farming practices, and how modern food is killing us. This was actually the first one we saw regarding going vegan and eating a plant based diet. Knowing that a burger and chocolate cake is “unhealthy” in theory, is different than seeing what a plant based diet can do, even reversing heart disease and diabetes. It was shocking at the time, we absorbed what we were able to, decided to attempt to eat less meat, and then continued watching more documentaries. Our resolve to eat less meat continued, and now that we have achieved a 99% meat free life, with very little dairy, we decided to watch it again. As we watched the movie again, now with a different mindset, we could enjoy better how much sense the movie makes. We also noticed that the “healthy food” they were eating looked so much better than the last time we watched it. Dishes and platters of food that before looked alien and worrying, now were making us hungry! It firmed our resolve to finish out the year focused on food, and solidifying the eating habits that are finally really coming together for us! Slice peaches into a bowl. Blend blackberries into a sauce and pour onto the slices. In a saucepan combine 2 cups of oats, 2 cups of almond milk, and 2 cups of water. Bring to a boil, reduce heat to medium, cook for about eight minutes, stirring frequently. 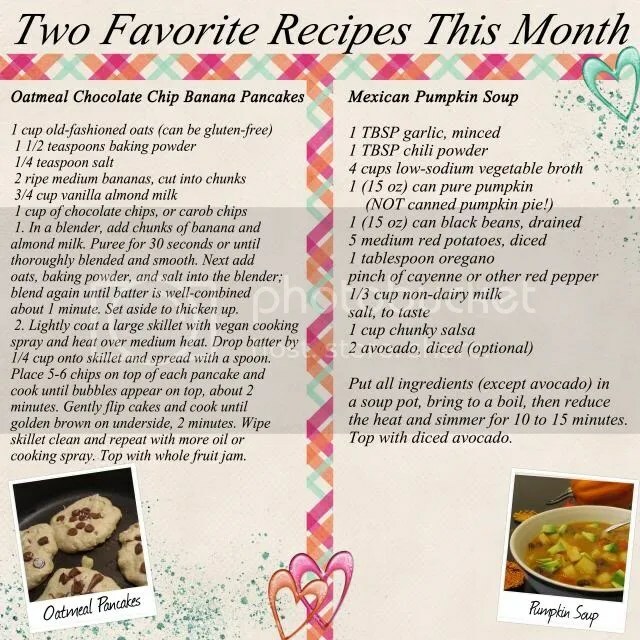 Add vanilla, bananas, and powder. Stir well. Cook for several more minutes, or until desired consistency, do not overcook. Top with bits of apple. Changing the way you eat is not about cutting foods out of your diet. That’s the part most people get hung up on. It’s not about deprivation, it’s about change. Saying “I’m not going to eat cheese today” gets you nowhere. All you can think about is cheese. Instead, if all day you are thinking about the wonderful juicy peach you bought for an afternoon snack, and how tasty that will be, you have positive thoughts. What we learned this month is to focus on what we are able to enjoy. It can’t be looked at as “I’m going vegan, I can’t eat any ‘real’ food!”, or your list of eating choices will be very limited. It must be “I’m going vegan, I can eat these foods!” Then make a list of healthy sweet and satisfying vegan alternatives such as Pina Colada Juice, Bell Pepper Romaine Salad, Apples & Peanut Butter, Pistachios & Cashews, Cucumber Carrot Salad, and Fresh Oranges. Looking over even this short list, is it any wonder that simply eating healthier food can cure illness? I had the first salad of my life this year, and it was not so bad as I’d imagined! 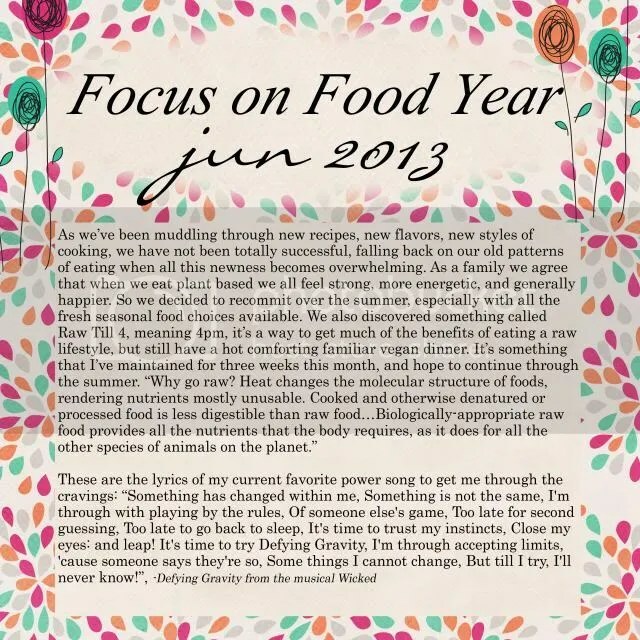 When we cut out meat, we went through a couple bad weeks before the cravings faded. The same happened with milk. Recently cheese was next, and it was so hard, three solid days of shaking like drug addict. What I could not manage to give up was the bread, finally I buckled down and went through my four worst days of withdrawal, including flu-like symptoms, cold sweats, and withdrawal shaking, but broke down on the fifth day. Jared lasted about the same. Obesity has long been blamed on weak willpower, overeating, genetics and lack of exercise. Now scientists increasingly are seeing signs that suggest there may be an additional contributor: food addiction. Research has confirmed what has been long suspected: food makes us feel good. Food triggers the body to release neurological chemicals similar to pharmaceutical drugs like Valium. When we are driven by addictive food cravings, just like with drugs or caffeine, we are more likely to overindulge. It’s difficult to say just eat less bread, it would be similar to asking a cocaine addict to scale back their use. The addictions interactions with your brain chemicals would not allow this, which is why drug rehabilitation usually operates on a cold turkey basis. As we discovered with meat, once you stop eating the foods your body can’t process, your body feels better, and does not have any interest in those foods. Even a few months ago I could never imagine a future that I would not need bread as a comfort food. Now I’m looking at trying to create that future, and it’s both scary and exhilarating. Place all salad fixings together in large salad bowl. Serves 1-2. Since last august we’ve mostly been successful with our vegetarian goal, and decided to take the next step for our health – going vegan. 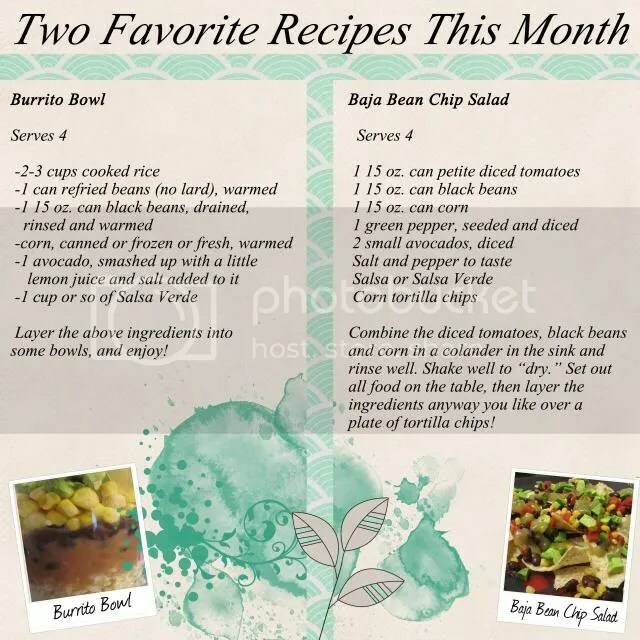 I got about twenty books from the library with vegan recipes, and as I researched vegan diet and recipes I discovered there was an even healthier way to live. Only eating raw food. Some consider raw honey, or raw fish part of this regime, others do it along with vegan, meaning no animal products. We thought that maybe we’d try that ‘raw thing’ later. However! 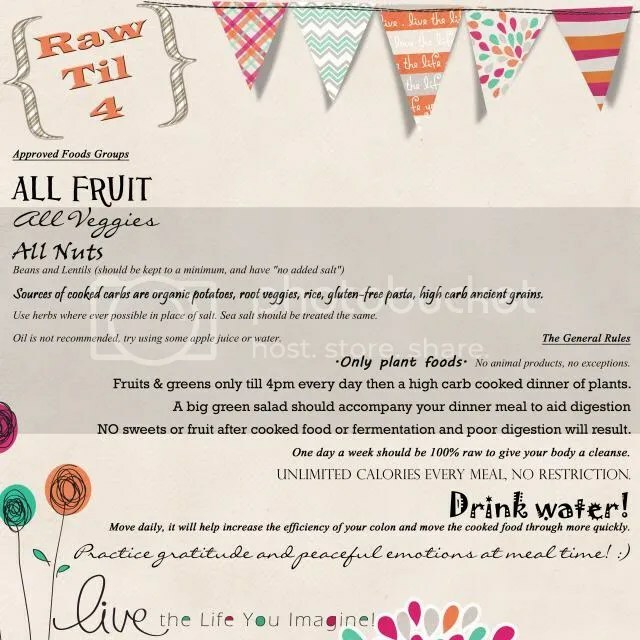 After a week of trying to cook vegan, with tofu and fake soy cheese, the food was repulsive, and I was still feeling my food related sickness, and we decided to really research that top rung of health, vegan raw. I returned all my vegan recipe books and checked out twice as many on living a raw lifestyle, and what we discovered was nothing short of miraculous! Regular people who had stumbled onto this info of a plant based raw way of eating were curing themselves of everything from allergies to diabetes! Even shrinking tumors, and stabilizing cancer! This way of eating was healing their bodies instead of treating it with medication. We wanted to try this, and burrowed into our forty or so raw books to gather as much info and recipes and tips as possible. With my dairy and gluten intolerances, and Jared’s migraines and kidney stones, we want to shift our eating habits to live without constant illness. 2. Toss all sauce ingredients into a high-speed blender, adding up to 1/4 cup water as necessary to facilitate blending. Blend until smooth and creamy! 3. Add sauce to noodles, toss to coat evenly, and enjoy! When we first started learning more about the world, for example what is wrong with the food or how dangerous plastic is, my mind was whirling. 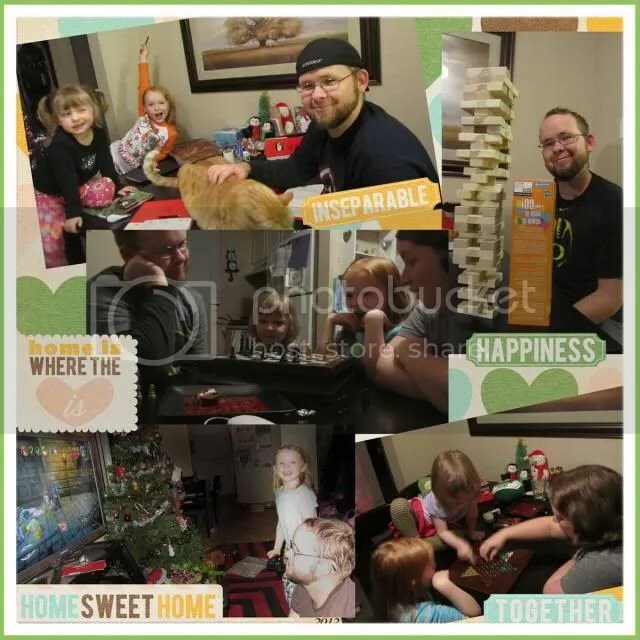 I decided to type out everything in my own words, which became these ‘essays’, which I scrapbooked and included in our family photo album to chart the changes we were making in our life. Since I’m on vacation this week with my in-laws, I thought it would be a good time to post all my essays from last year, showing what we learned, and how we’ve shaped our lives around this information to be the people we are this year. “Live intentionally.” Sounds kinda Zen, huh? Our next task was to simplify our life, even though we’ve made many changes recently, and it was initially a lot of work, simplifying had already started with some of the things we put into place. We had simplified our possessions. We had simplified our process for transportation and resources, which in turn simplified our budget. We had one thing left to change: “Sometimes we schedule things back-to-back-to-back, so that every minute of every day is planned out. That leads to stress and problems. Instead, schedule as little as possible each day, a more spaced-out schedule is much more relaxing than a cramped one.” We’ve always been a close family, but we are always out and about, missing that important home time to just relax with each other. We still plan adventures, but they are fewer, and more meaningful then hoping in the car to go to the mall, and I wanted our nights to consist of more than hours every night mindlessly staring at the TV. With no car and less TV, we began having higher quality, and more enjoyable family time, even cooking and cleaning became reynolds clan togetherness time. We made a easy plan for the week. Mon-Fri we eat dinner at the table together, then chose what do after, playing a game, or trying a new recipe, or reading aloud together, watching a movie. Saturday is a bus to the library, then the same bus to the store. Saturday afternoon is deep cleaning of the apartment, or an out of the home adventure. Sunday is a day of rest. So simple. “Fragrance” on an ingredient list may be the most common type of chemical in the home. It can be found in anything, just check the label! Used in laundry detergents, fabric softeners, dryer sheets, cleaning supplies and disinfectants, air fresheners, deodorizers, shampoos, hair sprays, gels, lotions, sunscreens, soaps, perfumes, powders, and scented candles, “fragrance” is not a natural scent added to your product, they are a class of chemicals. The term “fragrance” or “parfum” on personal care product labels can be a cover for hundreds of harmful chemicals known to be carcinogens, endocrine disrupters, and reproductive toxins. Another hazardous chemical “Paraben”, also known as: methylparaben, propylparaben, ethylparaben, or butylparaben, are a class of artificial preservatives widely used in cosmetics and personal care products which mimic the activity of estrogen in the body, causing the promotion of growth of breast cancer cells. Next are “Phthalates”, they are used in cosmetics, fragrances, plastics, deodorants, and body care products. They may disrupt hormone receptors as well as increase the likelihood of cell mutation. Unbelievable. We are applying these chemicals directly to our bodies. And isn’t it ironic that we actually contaminate our air when we use cleaning products with harsh chemicals – some of which are carcinogens – to “clean” our homes? We switched to the following products around the home, and also began using vinegar and baking soda to scrub bathroom counters and the tub. DEODORANT: “Aluminum-based compounds are the active ingredients in antiperspirants. They block the sweat glands to keep sweat from getting to the skin’s surface. Some research has suggested that these aluminum compounds may be absorbed by the skin and cause changes in estrogen receptors of breast cells. Deodorants can also contain Parabens, known to create estrogen in the body. Propylene Glycol, a neurotoxin that causes kidney and liver damage. TEA & DEA, known to cause allergic reactions, liver and kidney damage.” Now wait a minute, so putting the kidney damage aside for a moment, two of the main ingredients in deodorant may cause breast cancer? No thank you! 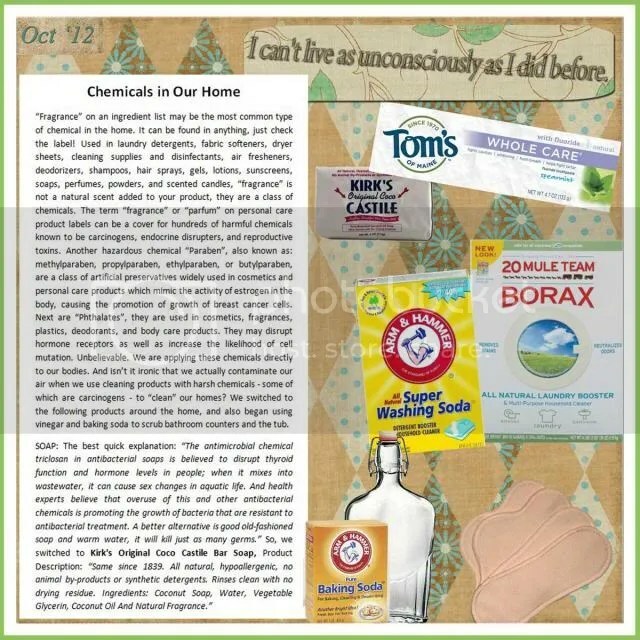 This was a priority for us, so we replaced our deodorant two months ago with one tablespoon of Baking Soda mixed into one cup of water, applied to your underarms with reusable/washable sturdy cloths that I made from fabric scraps. And after a couple days getting used it, the mixture has worked perfectly. I switched to homemade cloth pads for my period. I stopped wearing makeup. We switched to natural toothpaste and lotions, and we are working on a shampoo replacement. 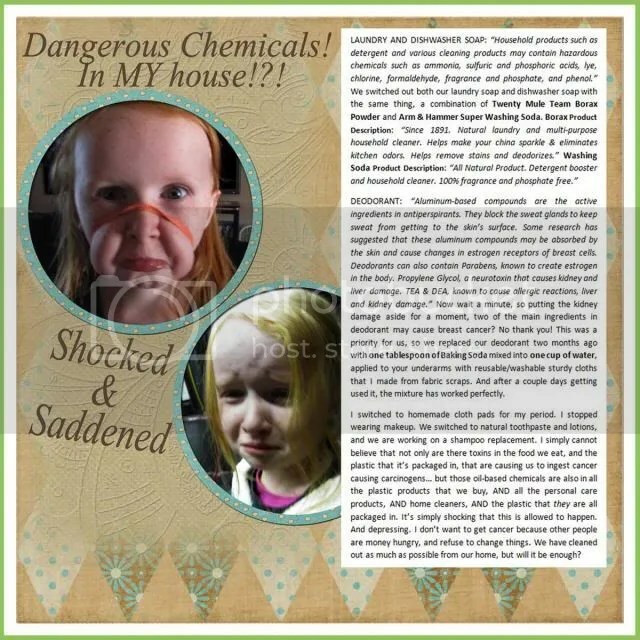 I simply cannot believe that not only are there toxins in the food we eat, and the plastic that it’s packaged in, that are causing us to ingest cancer causing carcinogens… but those oil-based chemicals are also in all the plastic products that we buy, AND all the personal care products, AND home cleaners, AND the plastic that they are all packaged in. It’s simply shocking that this is allowed to happen. And depressing. I don’t want to get cancer because other people are money hungry, and refuse to change things. We have cleaned out as much as possible from our home, but will it be enough? With the “microwave-safe” plastic gone, and the ceramic dishes breaking in the microwave, we found that we were rarely using it. I wondered if we needed one at all? 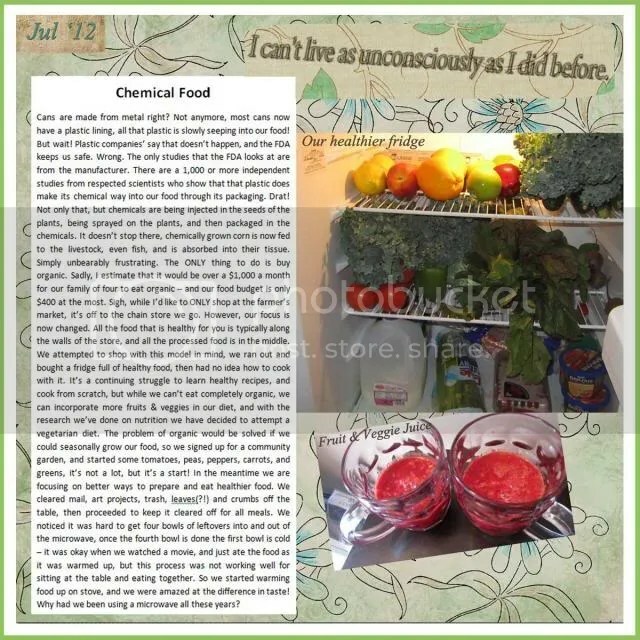 In Dr. Lita Lee’s book, Health Effects of Microwave Radiation, she stated that “every microwave oven leaks electro-magnetic radiation, harms food, and converts substances cooked in it to dangerous organ-toxic and carcinogenic products.” However there are other articles that encourage microwave use, one such article states: “The “leakage” of microwave radiation is strictly monitored by the FDA and manufacturers have to prove that their microwave oven leaks only a miniscule amount of radiation.” Well that’s good, we’re only eating small amounts… uhg, mental head slap! Out went the microwave! It’s been gone a month now – and I have not missed it once! Our food tastes better when it’s slowly re-heated on the stove or in the oven. And it got me thinking… …what else might be lazing around the apartment making us sick, or just plain wasting our time and resources. My eyes rested on the third tv, the few plastic toys that we’d left in the girls room after the plastic purge a month ago, they never play with them… …things just wasting space, like the second desk, and things collecting dust like the never used golf clubs. We did a room by room, item by item inventory of EVERYTHING we own. From the couch to the candlesticks. We did a more thorough search for plastics, and tossed out what we could. Most of it was too useless to even sell. Also, have you ever toasted your bread in a frying pan with some butter? Heavenly we discovered – so goodbye to the toaster! The biggest thing we dispatched was the car. Cars = gas guzzling machines that are an endless drain on personal finances and the worlds resources. They depreciate in value, while I have to pay for gas, car insurance, oil changes, car washes, DMV fees, parking fees, traffic tickets, and car accidents with large deductibles. Plus I trend toward stress and road rage at incompetent drivers, AND I have to scrape the ice off the windshield every morning in the winter. Or, for $100 a month, I can hop on the bus right outside my apartment complex, transfer to a train, and it drops me off in front of my work. One bus down to the library, or the store. And where else do you really need to go? Nowhere that can’t be reached by bus, or an occasional rental car. And so that is how we got rid of our “stuff”, everything that wasn’t useful or meaningful. Next we turned our attention to the resources we were consuming. We are signed up for wind energy, it costs a little extra, but it’s worth it for the peace of mind. Still, do we really need to use so much of it? Does the tv really need to be on for background noise? And does the computer need to be kept on 24/7? Do we have to take twenty minute showers? 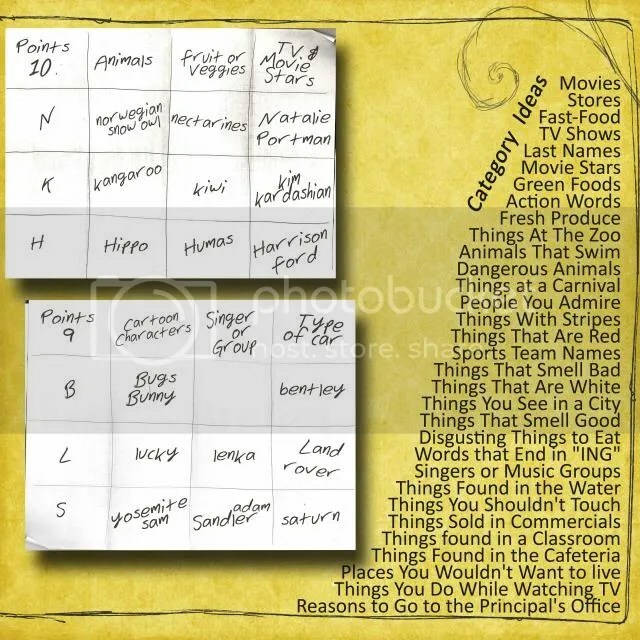 We put rules into place to severely cut back on our “screen time”, unplugged all the power strips when not in use, had low flow aerators installed on our facets and shower head, and used the light from the window during the day instead of turning on lights. We also sold anything that was always constantly plugged in wasting power, like the clocks, night lights, and the raucous pesky home phone. We invested in a hand crank powered radio, switched the clocks/nightlight to use rechargeable batteries. We also hand wash some of the dishes, only run the dishwasher when it’s full, and use blankets instead of the heater when possible. Next we switched to energy-efficient compact fluorescent bulbs, they provide an equivalent amount of bright light, and use only 10% of the energy consumed by a normal light bulb. By over-using power the population is creating more carbon than the world can renew back to oxygen, we need to breathe oxygen, so we are literally suffocating ourselves. Our family’s measures might be considered extreme, but what would be the effect if every household moved to conservation methods, instead of their consumer methods? As soon as the tv is turned off, my youngest daughter’s first request is always “can we go play outside?” and my response is always a cheerful “Absolutely!” Why didn’t we do this sooner? All those hours watching mindless cartoons, they could have been outside playing in the grass! What about my tv and computer time? I discovered that with the “screens” off I spent A LOT more time with my family, we read books more, individually and out loud to each other, even my non-book-worm hubby. 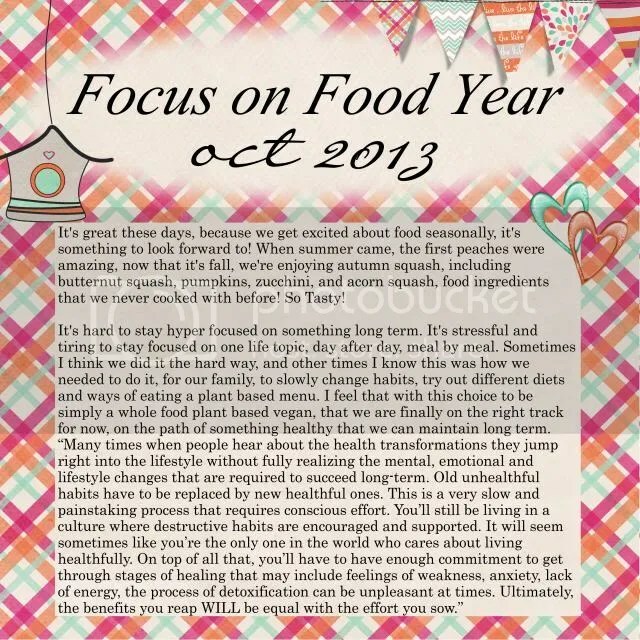 We put more time and thought into our cooking, improving our food choices. We spent more time outside, on walks, and at the park. We played more games, we laughed. We transitioned from lethargy to bliss, and discovered that energy conservation is not a hardship. Cans are made from metal right? Not anymore, most cans now have a plastic lining, all that plastic is slowly seeping into our food! But wait! Plastic companies’ say that doesn’t happen, and the FDA keeps us safe. Wrong. The only studies that the FDA looks at are from the manufacturer. There are a 1,000 or more independent studies from respected scientists who show that that plastic does make its chemical way into our food through its packaging. Drat! Not only that, but chemicals are being injected in the seeds of the plants, being sprayed on the plants, and then packaged in the chemicals. It doesn’t stop there, chemically grown corn is now fed to the livestock, even fish, and is absorbed into their tissue. Simply unbearably frustrating. The ONLY thing to do is buy organic. Sadly, I estimate that it would be over a $1,000 a month for our family of four to eat organic – and our food budget is only $400 at the most. Sigh, while I’d like to ONLY shop at the farmer’s market, it’s off to the chain store we go. However, our focus is now changed. All the food that is healthy for you is typically along the walls of the store, and all the processed food is in the middle. We attempted to shop with this model in mind, we ran out and bought a fridge full of healthy food, then had no idea how to cook with it. It’s a continuing struggle to learn healthy recipes, and cook from scratch, but while we can’t eat completely organic, we can incorporate more fruits & veggies in our diet, and with the research we’ve done on nutrition we have decided to attempt a vegetarian diet. The problem of organic would be solved if we could seasonally grow our food, so we signed up for a community garden, and started some tomatoes, peas, peppers, carrots, and greens, it’s not a lot, but it’s a start! In the meantime we are focusing on better ways to prepare and eat healthier food. We cleared mail, art projects, trash, leaves(?!) and crumbs off the table, then proceeded to keep it cleared off for all meals. We noticed it was hard to get four bowls of leftovers into and out of the microwave, once the fourth bowl is done the first bowl is cold – it was okay when we watched a movie, and just ate the food as it was warmed up, but this process was not working well for sitting at the table and eating together. So we started warming food up on stove, and we were amazed at the difference in taste! Why had we been using a microwave all these years? Genetically Modified Foods, or GMOs, sound like something out of a sci-fi movie, but really we have been eating them since the 1980’s, around 1995 they suddenly appeared in 2/3rds of all US processed foods. To genetically change a seed, they take the DNA from other plants and animals, and inject it into the seed, organisms that cross unnatural gene lines, such as tomato seed genes crossed with fish genes. The idea is to make these plants resistant to bugs and pesticides, but it is polluting the world’s food supply while it kills the good bugs with the bad, like bees and butterflies. Could it be killing us too? Yes. Health concerns for these new seeds are legion, the worst being cancer, allergies, and antibiotic resistance, all of which are on the rise over the last two decades. Many studies are accessible, and scientists who are not on the payroll of the seed maker, Monsanto, are worried about the long-term health effects. “[GMOs] can replicate themselves out of control in the wild. This can happen, without warning, inside of our bodies creating an unpredictable chain reaction. The impact can be passed on to future generations.” Some GMO crops include soy, corn, rice & canola-think how many foods contain corn syrup, or canola oil. Experts say 60% to 70% of processed foods in the US have genetically modified ingredients. Most corn and soy are now GMO grown, and the USDA maintains the rule that they do not have to be labeled. In Europe all GMO foods have required labeling, and in England GMO food is not even allowed to be grown! They don’t want their seeds contaminated. The tainted seeds fly on the wind up to seven miles away, contaminating regular seeds across the county, and if that was not bad enough, the maker of these evil mutant seeds is suing any farm that their seeds land on, as if the farmers can control the wind. And in every case that goes to court, Monsanto wins – this is truly a sad world that we live in. Even the cows, chickens, and fish are being fed GMO corn, so we are eating it from every source. 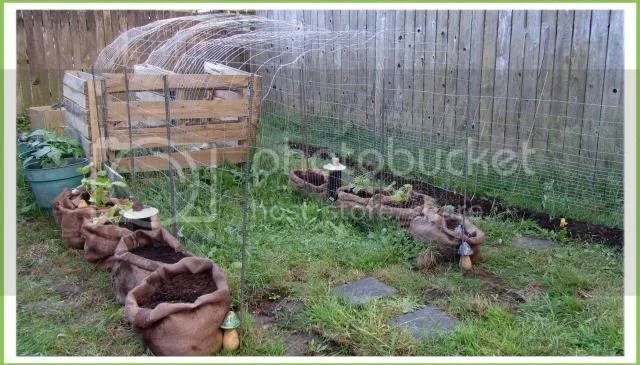 The obviously best way to eat, is to grow all of your own food, but even that has its hazards with Monsanto looming over every patch of soil. The absolutely most terrifying part? 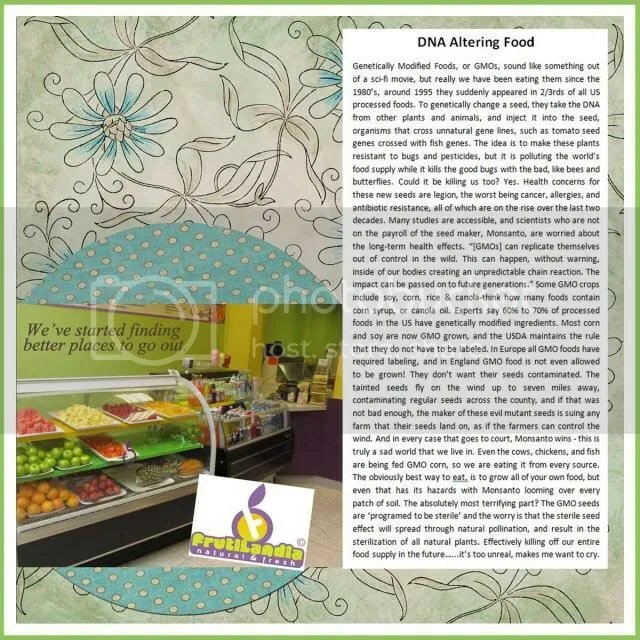 The GMO seeds are ‘programed to be sterile’ and the worry is that the sterile seed effect will spread through natural pollination, and result in the sterilization of all natural plants. Effectively killing off our entire food supply in the future……it’s too unreal, makes me want to cry.